Summer weather has finally arrived. The air conditioning is on and kicks in about 4:30 to keep the house a reasonably decent 80 degrees. These summer mornings are perfect for deck sitting. It's a comfortable 70 degrees at 8:30 and the deck is shaded until around 11 so I sit out there with my breakfast and read or stitch. This past Sunday, it was read. 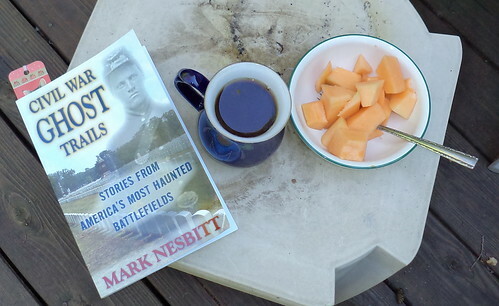 Hot tea and fresh cut cantaloupe. The melon was so sweet and juicy. I wound up eating two thirds of it over the span of 3 hours spent reading. I pulled open the screen across the back door and that allowed a visitor onto the deck. This was the chair I was sitting in. She stayed, very happily, behind me where I could reach up and give scratches. She went to the deck steps only once. I looked up from my book as she started down the steps. "Pilchard! No!" She backed up, jumped up into the chair next to me and didn't make any attempt to leave the deck. 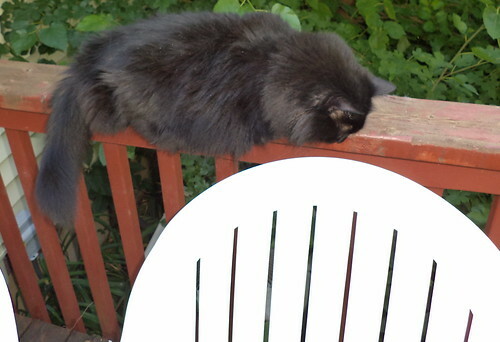 She spent the rest of her time outside with me lazing on the railing. She even stayed put when I'd go into the house to cut up another slice of cantaloupe. These are the days that recharge my soul. There can be so much stress in life that we can forget to stop and breathe. For me, having the ability to stop and sit and read on a bright summer's day resets my equilibrium. Having four-footed company also helps.